I have set myself a project for an up and coming trip to Thailand to come up with a piece for my wall of a wildlife scene. I want it to be a large piece so that it will transport me back to Thailand while I am at home. I noted that some of the gallery visits I have made to landscape photographers for example Peter Lik and Rodney Lough Jr use large format cameras. This can be seen in the finest of detail within the images. I wanted to look into how I can ensure to get a good image for a large print. I found the following article from Outdoor photographer magazine. See the link below. I am currently learning the importance of post processing and printing. How to recognise a good print form a bad one. How important it is to calibrate my computer and to use a good printer if I am not printing my own images. It was recently suggested to me to take ten very different images and put them into one Photoshop file I can then print these on some of the paper I am interested to learn about to see its effects. I also take note when in a gallery of the paper they have used for each style of photograph. It is a never ending world photographing, editing and printing but it is a beginning. 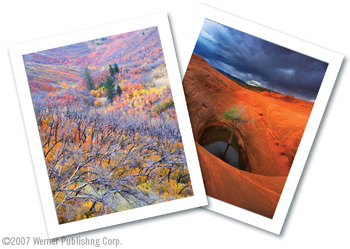 The digital print gives photographers more freedom and control in getting great images. Printing possibilities offer so much for landscape photographers today. Digital photography along with inkjet prints give greater freedom for the photographer to truly capture what he or she saw. ABOVE LEFT: Fall color, Wasatch Mountains, Utah. ABOVE RIGHT:Cottonwood tree growing in a sandstone bowl, during a spring thunderstorm, Grand Staircase-Escalante National Monument, Utah. For landscape photographers, the print has gone beyond a simple record that goes on the wall. With printing so accessible to all, photographers have the opportunity to create dramatic, large-format prints that demand attention. As an outdoor photographer, I can honestly say that the advent of digital photography and printing technology now allows me greater freedom, both in the field and in the studio. Moreover, after the hard work in the field, there are few things as rewarding as seeing a beautiful print roll off the printer, taking you back to that special moment. Much of my older work was done in large format, though for the past few years my images have been predominantly captured with D-SLRs. This latter fact often is greeted with surprise, especially at the sight of some larger prints. As a large-format photographer, I was as skeptical as anyone about the enlargement potential of digital capture—until I tried it myself. Depending on the print process, image resolution numbers in the 200 to 400 dpi range are generally required to produce a sharp print. To put this in context, in order to make an 8×10 print at 200 dpi, your file will need to be sized to 1600 x 2000 pixels (3.2 megapixels). This is still far below the native resolution of most modern digital cameras. When you make your own prints, you gain control over every aspect of the image, allowing you to customize the results to your taste and style. Such control is all the more meaningful considering the ever-growing array of choices— from printers and inks to color management tools and digital imaging applications, all the way to the large variety of papers, each with its own unique look. I like to approach the processing and printing of my work with the same mindset as I do capturing images in the field. I seek to create something that’s unique and expressive, something that communicates the sense of awe and discovery that I experienced myself when in the presence of great natural beauty. My prints are visualized outdoors, on the trail, in the depths of canyons or on the slopes of mountains. As I frame and compose my images, I also consider how they might look on paper. The process involves more than just an appealing composition, but also examining areas of detail that may require attention. When back at my studio, my imaging workstation is my light table, my development and processing darkroom, and my print lab all rolled into one. As I pull up newly made images, memories of each moment come alive. The ability to review multiple compositions side-by-side is invaluable in the process of editing and selecting which images to print. The digital process allows me to push the envelope and choose the one frame that’s just different enough to make it that much better than other similar ones. Just as there’s no one right way to photograph a given subject, there’s no one right way to print a given image. Famed photographer Ernst Haas noted that “the best pictures differentiate themselves by nuances,” and the power of digital printing puts complete control of such nuances in your hands. While some images benefit from deep saturated blacks, others may rely on subtle pastels or high-key whites; others still may benefit from the glare-free surface of cotton rag papers or the luscious, saturated gloss finish of coated ones. The choices abound and readily plug into your workflow. Inkjet printers fall into two main categories: those using pigment-based inks and those using dye-based inks. Pigment inks are more stable and archival since they’re more resistant to UV light, but they‚’re more expensive to produce. Dye inks have a broader color gamut, though generally aren’t as stable and will fade sooner when exposed to UV light. Modern inks, both pigment and dye, have come a long way toward improving both archival and color qualities. When it comes to paper, the wide field of options falls into two main categories: coated papers (e.g., resin-coated, or RC), which offer more traditional glossy or textured surfaces, and fine-art papers (e.g., cotton rag), which have a matte surface and produce prints looking like something between a photograph and a highly detailed watercolor painting. Remember that dye inks, while having more favorable color gamut, look best on coated papers and generally aren’t suitable for fine-art papers. Pigment inks work very well on both types of paper, however. How can a printer know what red looks like on your monitor so it can reproduce it accurately? The solution is color calibration or profiling. A color profile maps colors to a device-specific way of producing those same colors, such as a printer. Monitors are generally profiled (or calibrated) using a color-measuring device called a colorimeter. These are available from vendors like Datacolour, Pantone and others. Printer profiles are specific to each paper and ink combination. Most printer manufacturers provide a set of ICC profiles with their printers, and the same is true for many independent paper manufacturers. Keep in mind that having a color-managed workflow and ICC profiles for your monitor and printer ensure consistency, but rarely result in a 100% match. Differences result from the fact that transmissive media (e.g., your screen) and reflective media (e.g., paper) have some inherent characteristics that can’t be fully overcome with profiles. Experimentation is needed for best results. This article is taken from apogee photo.com the entire article with iamges and image instructions can be seen at the below link. © 2011 Brad Sharp. All rights reserved. This macro was taken so close that a complete DOF could not be obtained even at f/20. © 2011 Brad Sharp. All rights reserved. This macro was shot at f/9, yet has a larger DOF due to Focus Stacking. Focus stacking is a process that combines technique (shooting) and processing (software) to dramatically increase the Depth of Field (DOF) in photographic images. It is accomplished by taking multiple images of a single subject, each taken at different focal distances. Those images are then aligned and merged together to produce a single composite image with an extended DOF. Think of HDR photography, but instead of bracketing the exposure, you will be bracketing different focal points throughout the subject. I love macro photography. It is both challenging and exciting. For me, the most challenging part of macro photography is keeping the entire subject in focus. Focus stacking allows me to do this. I also use Focus Stacking when I want to photograph a landscape scene that includes a very close foreground. By using Focus Stacking I can get the entire landscape in focus, and still use my optimal aperture setting of (f/8-f/16). Focus Stacking requires a subject that remains stationary. If your subject moves the multiple images won’t align correctly and the final image will fail. The best way to ensure that your camera doesn’t move while taking multiple images is to use a sturdy tripod with a remote shutter release. While most focus stacking software may be able to align hand-held images, it’s very difficult for you to acquire accuracy during shooting and therefore, the process will require a lot more work. You’ll find that it is much more challenging, however it can be done. exposure and manual focus. Set the aperture between f/8 and f/16 (or your len’s “sweet spot”. Then set the shutter speed to capture the correct exposure. If you are using a tripod, there will be no limits to how slow the shutter speed can go. If you are shooting hand-held, you will have to maintain the minimum shutter speed necessary to avoid camera shake. There are two methods used for gradually incrementing the focusing distance in order to increase the Depth of Field. 1. Moving the Camera: This method is usually done in a studio where the photographer can have more control. This method captures multiple focus points in the same image by minutely moving the camera between each shot, keeping the focusing point the same. Since only a small portion of the image will be in focus in each shot, moving the camera closer between each shot allows you to move that small portion of focus through the depth of the image so that every portion of the image will be in focus in at least one of the shots. In order to move the camera smoothly, it will be necessary to use either focusing rails or bellows. I use the Adorama Macro Focusing, 4 Way, Fine Control, Camera Focusing Rail. It allows me to move the camera in very small increments, without disturbing the camera. 2. Refocusing: In this method, instead of moving the camera, you refocus the lens on different portions of the subject to get the entire subject in focus. This method usually involves taking three to a dozen or more images. This method allows photographers to use Focus Stacking while just using a quality camera and a sturdy tripod, and still get excellent results. Start by focusing on the nearest point of the image that you want to be in focus. For the next shot, being as careful as possible, adjust the focus on your lens to focus a little deeper into the image, and take the shot. Keep doing this until you have captured all parts of the subject that you want to be in focus. The depth of the subject, the magnification used and the aperture setting all go into determining how many images you need to shoot in order to make sure you have the entire subject in focus. Regardless of which method is used (moving the camera or refocusing), the entire image is enlarged, or made smaller, depending on the direction of your focus or the direction you move the camera. As a result, all of these individual images will need to be aligned before they are merged together. Whichever photographing technique you use, you need to make sure that the images are taken in sequence. Shoot from the back to the front, or visa-versa, but if you go out of order the software won’t be able to blend the images together properly. There are several software programs you can use to align and merge multiple images together and the methods used by each are all very similar. Photoshop CS4 and CS5 both do this very well. Other programs to consider are: Helicon Focus, CombineZM, Zerene Stacker, and TuFuse. Not only are there several different software programs to focus stack images, but there are several methods within each. In Photoshop CS5 there are several different combinations of steps to accomplish the same end result. I will describe two methods in this article, but there are several other methods, including using Photoshop Lightroom. For my first example, I had taken a total of 20 images of the same orchid for merging. I used a focusing rail and started by focusing on the part of the orchid that was furthest from the camera. Then I moved the camera further and further away from the flower in about 1/16th inch increments, until I had all of the areas of the flower in focus up to the closest area from the camera. At this point, you will have moved your camera approximately 1 ¼ inches in total from the first shot to the last shot. I did not refocus each shot as I moved the camera. For the example below, I am only using six of the 20 images I shot to make it easier to follow along. The next 4 partial images depict the sharp and blurry portions of the orchid from the first photo shot and the last photo shot. Image 0665 (first image shot): This is the portion of the orchid that was the furthest away from the camera. Notice you can see the detail on the orchid. Image 0685 (last image shot): As I moved the camera further and further away, and focused on the areas of the flower closest to the camera, the area of the orchid that was furthest away in my first shot is no longer in focus. Image 0665 (first image shot): This is the portion of the orchid that was the closest to the camera in the first image. Notice that unlike the portion of the orchid in Example 1 A, this portion of the orchid is blurry. Image 0685 (last image shot): This is the portion of the orchid that was the closest to the camera in the last image. Notice that unlike the portion of the orchid in Example 1 B, this portion of the orchid is in focus. Open Photoshop Bridge in CS4 or CS5 and select the images you want to use. (Left) This is how the combined images look in Photoshop CS5 at this stage. 8. Keep the default settings of Stack Images and Seamless Tones and Colors & click OK.
© 2011 Brad Sharp. All rights reserved. © 2011 Brad Sharp. All rights reserved. This is what the images will look like at this stage. If you look at only one of the layers it will look something like this… It is because the program determines which portion of each image is in focus and only keeps that portion. 9. Now select Layer ->Flatten Image. Now you are ready to edit the image like you would with any other image, such as cropping, adjusting levels, etc. This is the final image, where the entire flower is in focus, including the hood and pouch (my scientific terminology), while the background is slightly blurred. I like using this method because it gives me more options and control. I can see what each layer looks like. If the focus stacking does not work, I can go back and see which layer is causing the problem and remove it. As you can see below, I can walk through the process one step at a time, and make changes as necessary. 1. Open all the images you are going to use into Photoshop CS5. 2. Combine all images into one file. Start with the first image you shot and then copy and paste each additional image on to that image. This now creates numerous layers on the first image file. This is your opportunity to check the small details to see if there are any issues that need correcting with any of the layers. 3. Highlight all of the layers. 4. Align the layers by going to Edit -> Auto-Align Layers… -> Collage (from here on, the steps are the same as above). 7. Crop the image and edit as you would any other image. The image used in this example was shot at 1/200 sec. at f/7.1, ISO 100. Focus stacking is becoming more and more popular as cameras and software get better and better. It is a great way to increase your DOF without losing image quality. I’m am looking forward to the day when this feature will built into the cameras the same way Automatic Bracketing is now. The Selection tools select pixels, the Brush tools paint on pixels with the foreground color, the Type tool typesets text, and so on. As you might know most tools have hidden tools behind them, indicated by a small black triangle just below and to the right of the tool. Access hidden tools by clicking the mouse button on a tool and selecting it. Tool keyboard shortcuts are shown to the right of the tool name. Any time you want to move image pixels (not selection borders alone), you need the Move tool, unless you want to nudge pixels a little at a time with the arrow keys. With the Move tool active, click the mouse button and drag the pixels to move them. If a selection is active, the Move tool moves only the selected pixels on the active layer. If there is no selection active, the Move tool moves all the pixels on the active layer when you drag in the image window. Tip: If the layer is linked to other layers, the linked layers content also moves. Use the Marquee selection tools to select rectangular or oval shapes, or single rows of pixels. Press Shift while you drag with the Rectangular Marquee tool to drag a square, or press Shift while you drag with the Elliptical Marquee tool to drag a circle (release the mouse button first, then release Shift). You can re-size these selection borders (not the image pixels) by choosing Select ➪ Transform Selection or by choosing Select ➪ Refine Edge. Use these tools to select pixels by dragging or clicking around objects. Use the Lasso tool to select rounded or irregular shapes that don’t have to be precise (drag around the shape until you get back to the starting point to close the shape). For precise selections, you can make a Pen tool path and load it as a selection or manipulate duplicates of channels to help you make a selection. The Polygonal Lasso tool is good for selecting objects with straight edges (click on each corner until you click on the first corner again to close the selection). If the edges are really straight, you can be pretty precise with this tool. The Magnetic Lasso tool finds the edge of an object as you drag near the edge and the selection snaps to the edge as you drag (drag to the starting point to close the shape). The Magnetic Lasso tool works best on objects whose edges have a lot of contrast with the background. If you don’t want to complete the Magnetic Lasso selection, press ESC. The Quick Selection and Magic Wand tools select pixels by examining their colors. Use the Quick Selection tool to select multiple different colors that are adjacent to each other but enclosed in a surrounding color that contrasts with all the colors you want to select. Drag across the colors you want to select. The Magic Wand tool selects colors that are similar to the color you click on with the Magic Wand. The number of colors it selects depends on the Tolerance setting you enter in its Options Bar. Tip: Add to selections by pressing Shift while you make an additional selection with the same or a different selection tool. Subtract from selections by pressing Alt while making an additional selection. Or choose Select ➪ Save Selection or Select ➪ Load Selection) to add to or subtract from selections. Load Selection gives you the option of adding or subtracting the loaded selection from an active selection. Use the Crop tool to crop an image to its intended size. Drag with the Crop tool, and then move any of its handles to adjust the crop. Press Enter when you’re finished. If you don’t want to complete the crop, press ESC. You can use the Crop tool’s Options Bar to enter the exact dimensions and resolution of your selection, but this can cause undesirable re-sampling if you are enlarging and don’t have enough resolution. If the dimensions and resolution boxes are blank, you don’t have to worry about resolution resizing problems. These tools are used to create and select parts of images that have been sliced up in different sections for better display on the Web. The Slice tool is used to drag through an image to create slices; in other words, to cut the image into grid sections that can be saved with different settings. This way, you may be able to make each section a smaller file. If a large image is left whole and saved for the Web, it might be so large that viewers have to wait for it to load. The Slice Select tool can be used to select slices. Use this tool to find out a colors numbers; to do so, hover the Eyedropper tool over a color in the image while you look in the Info panel. This is helpful when color correcting or if you need to share color number information with someone. You can also use the Eyedropper tool to click on a color in the image to make it the foreground color. Drop the foreground color into the Swatches panel by clicking in the gray area inside the Swatches panel. Click with this tool in your image to set permanent color samplers in your image. The sampler and its color numbers appear in the Info panel until you delete the sampler. To delete a color sampler, Alt-click or right-click on the color sampler with the Color Sampler tool and press Delete. Use the Ruler tool to measure distances from one object to another or to straighten an image. To measure, drag the Ruler tool across what you want to measure, and check the Info panel for the measurement information. Click the Record Measurements button in the Measurement Log panel to record the data, which you can then Export with the Measurement Log panel menu. You can also set the Measurement Scale in the Measurement Log panel menu. To straighten an image with the Ruler tool, drag with the Ruler tool along the edge of something you want to straighten, then choose Image ➪ Transform Canvas ➪ Arbitrary. Photoshop automatically calculates the angle of rotation and straightens the image. Use the Count tool when you need to count objects in an image. Click once on each object, and a serial number, starting with 1, is placed on each object. Click the Record Measurements button in the Measurement Log panel to record the data, which you can then export with the Measurement Log panel menu. Click the Clear button in the Options Bar to start over with a new count or click the Count Group Color button to change the color of the numbers. Use the Healing tools and Patch tool to fill in bad spots, flaws, cracks, or damage with a good nearby texture or a texture in another part of the image, while matching the color that surrounds the flaw. These tools are often good at maintaining texture, but since they pull in some of the surrounding color, it’s usually best not to use the Healing tools or Patch tool when there is an undesirable color nearby. To repair a flaw with the Spot Healing Brush, make this tool at least a little bit bigger than the flaw and either click on the flaw or drag across it. The flaw should magically disappear. The Healing Brush tool works similar to the Clone Stamp tool, discussed below, in that you Alt + click with the Healing Brush to sample a good place in the image that you want to copy from, then release the mouse button, move the cursor to the flawed area in the image, and start painting over the flaw. The Healing Brush paints from the good area to cover the flawed area. It’s a good idea to make the Healing Brush at least a little bit bigger than the width of the flaw. You may need to re-sample from different spots often if the good spots are small or if you find you are starting to see repeating patterns in the flaw repair area. Use the Patch tool to drag a complete shape around a flawed area, then put the cursor inside the selected area and hold down the mouse button while dragging the selected flawed area on top of a good area (even if the color doesn’t match). The flawed area should seem to be magically repaired, with color that matches its surrounding area. If a person in a photo has red-eye, simply click with the Red Eye tool on the red part of the eye, and it should fill the red part in with black. If it doesn’t work quite right the first time, undo and try it again with a different Pupil Size and/or Darken Amount (in the Options Bar). But my favorite thing to do if it makes too large an area of black is to paint out the part of the black you don’t want from a previous state of the image with the History Brush. The Brush tool can be used to paint on an image. It uses the foreground color as the paint color. There are many options you can apply to brushes in the Brushes panel. The Brush tool has to be selected for the options to be available. When you change the options, you can see what a brush stroke looks like with those options in the bottom of the Brushes panel. One exception to the brush using the foreground color exclusively is that if, in the Brushes panel, you choose Color Dynamics and use foreground/background color Jitter, the brush alternately paints with the foreground and background colors when you drag it. To make a new brush preset, you can choose an existing preset in the Brushes panel, change some options in the Brushes panel, click the New button at the bottom of the panel, and give the new brush a name. You can also drag a rectangular selection around pixels in an image that you want to use for a brush shape, then choose Edit ➪ Define Brush Preset. Use the following tips for tools that use brushes (such as Brush tool, Clone Stamp tool, and Eraser): – Use bracket keys to re-size a brush. – Press Shift+Bracket Keys to change the hardness or softness of a brush’s edges. – When a brush is active, press the number keys to change the brush’s opacity (2 for 20 percent opacity, 3 for 30 percent opacity, and so on). – Press the X key to switch foreground and background colors. – To paint a straight line, click once in an image with a brush tool, release the mouse button, and move the mouse to a different part of the image, then Shift-click with the mouse.This should connect the two areas by painting a straight line. Use the Pencil tool to paint hard-edged lines. You can’t make the Pencil tool have soft edges. Use the Color Replacement tool to replace a color in an image with another color. Drag across a color to change it to the foreground color. The Options Bar settings are critical for this tool: – Mode: Color. Use this setting to change the color of the sampled area (but not the luminosity or lightness). – Sampling: Continuous. This tool continually takes samples of the color to replace as you drag, so you can only let the cross-hairs of the brush go over colors you want to change. – It’s usually best if you make a large brush in this case. – Sampling: Once. This tool samples the color to change when you first click the mouse button and hold it down to drag across a color. – Sampling: Background Swatch. This tool changes a color in an image if it is the same color as the background color. The Clone Stamp tool can be used to fix areas in an image and copy one part of an image over another part. To sample a good part of an image, Alt-click (PC) or Option+click (Mac) with the Clone Stamp tool on a good place in the image that you want to copy from. Then release the mouse button, move the cursor to the flawed area in the image, and start painting over the flaw. It’s good to re-sample often to avoid repetitive patterns. Use a very soft or semi-soft edge on the brush so that there won’t be a hard edge between the cloned areas and original areas. The Clone Stamp tool copies exactly from one area to another, but since you have to use a soft edge, some of the textural detail is lost. The Healing Brush tool maintains texture better, but mixes in colors that surround the flawed area, which may be undesirable. You may need to try both tools to see which one works best. The Clone Stamp tool can be set to blending modes other than Normal in the Options Bar for very useful retouching techniques. You can paint patterns onto an image with the Pattern Stamp tool. Choose a pattern preset in the Options Bar. To make a new pattern preset, make a rectangular selection of image pixels you want to use as a pattern, and choose Edit ➪ Define Pattern. The History Brush tool is one of my favorite methods for undoing things, especially just parts of things I don’t want. With the History Brush active, click in a box to the left of a previous History State in the History panel that you want to paint from and drag in the image to paint the previous state of the image. I especially like to use this to paint out halos when I’ve over-sharpened a bit. That way, I can get a lot of extra sharpening in other areas that I might not have been able to if I had stopped before halos appeared. This is useful when sharpening for print, since images tend to soften up on press. You can use reduced opacities with the History Brush, just like other brushes. The Art History Brush paints from a specified History State just like the History Brush, but it adds a painterly effect. Eraser tool erases to transparency the pixels you drag over a regular layer. If you use it on a background layer, it paints with the background color instead of transparency. If you use it on a layer that has locked transparency (see the transparency lock button at the top of the Layers panel), it paints with the background color instead of transparency wherever you drag over pixels, but it leaves transparent pixels transparent (because they are locked). Background Eraser Tool erases sampled colors of pixels on any kind of layer to transparency as you drag over them with the tool. Samples are taken by the cross-hairs in the center of the brush. The Magic Eraser tool erases to transparency the sampled colors of pixels on a regular layer when you click on the pixels. If you use it on a background layer, it changes the sampled pixels to the background color instead of transparency. If you use it on a layer that has locked transparency (see the transparency lock button at the top of the Layers panel), it changes sampled pixels to the background color instead of transparency, but it leaves transparent pixels transparent (because they are locked). Tip: To erase or select objects with intricate or wispy shapes, use the Extract command or another selection method. Use the Gradient tool to make gradients in a layer that contain gradual transitions from one color to another color or between many colors. You can choose different angles of a gradient, such as linear or radial, in the Options Bar. With the Gradient tool active, click the “Click to edit the gradient” button in the Options Bar to get the Gradient Editor. Click a preset gradient or make a custom gradient by clicking just under the horizontal gradient bar to put a new color in the gradient or click just above the gradient bar to add a different opacity to part of the gradient. To make the custom gradient into a new gradient preset, enter a name in the Custom box and click the New button. Click OK to set your gradient and close the Gradient Editor. To apply the gradient to a layer, drag in the layer with the Gradient tool. You can drag different angles and distances to get different results. When you click to sample a color with the Paint Bucket tool, it fills the sampled color with the foreground color. You can paint with the Blur tool to blur portions of an image. The Sharpen tool allows you to sharpen portions of an image. You can drag the Smudge tool to smudge parts of an image, as if you were dabbling in finger paint I prefer to use other methods that have more control over blurring and sharpening. Choose Filter ➪ Blur Filter for other blur options, and Filter ➪ Unsharp Mask or Filter ➪ Smart Sharpen) for other sharpening options. You can use masks or the History Brush to blur or sharpen only certain areas. Press Tab in order to switch between hiding the tools and panels. Press shirt and tab in order to leav only the tools visible. If you wnat your workspace set up in a particular way you can go to window \workspace\ save my workspace. You will find that you need to zoom in and out often to check your work what might look fine initially could look terrible when you zoom in. Actual size cmd+1 Fit in Window Cmd +0 zoom in CMD++ Zoom out + – hand tool is spacebar Double clicking the zoom tool in the tools panel puts you at 100% view. Zoom Marquee drag from the upper left to the lower right area you want to zoom to. While dragging a marquee appears when you release the mouse button the marqueed area zooms up to fill the image window. A new window for a different look. Choose windows arrange new window to create an additional window for your foremost image. For example if you want to see actual size to get an idea of your progress. Cycle through images press cmd tab. to flick through open images. Getting started with basic Tasks in Photoshop CS4. File open select image you want to work on. to Crop press c to access the crop tool and drag around the area of the image you want to crop. If you need to adjust it you can drag the handles around it. then double click in the center of the image or press return or enter key to crop the image. If you want to cancel the crop press esc. Chapter 3 Editing pixels in bitmap images Understanding Photoshop image modes Working in Black and white RGB or CMYK. The number of pixels in an image is measured in pixels per inch (ppi) The more ppi the more detail in the image. Unlike vector graphics bitmap images can’t be scaled without losing detail. Generally is best to use bitmap images close to the size you need if you resize a bitmap image it can become jagged on the edges of sharp objects. On the other side you can scale vector graphics and edit them without degrading the sharp edges. Bitmap is fine only in black and white not for colour not even for grey ,for a logo for example however you should work in RGB for images. Working in black and white. Create new fill and choose black and white. Set the sliders to achieve the best black and white image and then chose image mode grayscale. Use Duotone mode when you are creating an image with one to four colour image created from spot colours. The pantone matching colour system helps to keep printing inks consistent from one job to another. By assigning a numbered colour such as 485 for red. you dont run the risk of one printer using fire engine red and the next using orange red for your company logo. Choose image – mode – Greyscale Image Mode Duotone In the duo tone dialog box choose duotone from the type drop down list. To assign a second colour click the white swatch under the black swatch. This will open the colour libraries dialog box. now you can choose your colour. Duotone images must be saved in the Photoshop encapsulated postscript EPS format in order to support he spot colours. If you chose another format you risk the possibility of converting your colours into a build of DMYK. Click ok when your finished. A clut contains all the colour that make up your image such as a box of crayons. Choose image mode colour table to see the colour table making up an image. RGB is the standard format that you work in if you import images from a digital camera. For complete access to images RGB is probably the best colour mode to work in. If your having your images printed do not convert to the CMYK until your finished with the colour correction and you know that your colour settings are accurate a good print service may want the RGB file so that they can do an accurate conversion. CMYK is the mode used for final separations for the press. Do not take converting in this format likely. You will need to decide first where your file will be printed and on what paper stock so you can maximise the quality. talk to your print provider for specifications that are important when converting to CMYK mode. Lab Colour Lab lightness, A channel and B channel. This is a colour many high end professionals use as you can make adjustments to luminosity without affecting the colour. You can change the lightness or luminosity without affecting the A channel (green and red) or the b channel (blue and yellow). Lab is also a good way to work if you want to move from one colour system to another without loss of colour. Some professionals choose to work in lab mode because they can select just the lightness channel and choose filter sharpen unsharp mask to sharpen only the grey matter of the image leaving the colour noise free. Multi channel. Deleting a channel from an RGB, CMYK or lab image automatically converts the image to multi channel mode. THis mode supports multiple spot colours. Bit Depth. You have more functionality in the 16 bit or even 32 bimode. Depending on your needs you may spend most of your time in 8 bitmode. This is often all that you need. Bit depth or pixel depth or colour depth measures how much colour information is available to display or print each pixel in an image. Greater bit depth means more available colours and more accurate colour representation in the digital image. In Photoshop this increase in accuracy does also limit some of the features available so dont use it unless you hae a specific request or need for it. To use 16 bit or 32 bit colour mode you also must have a source to provide you with that information such as a scanner or camera that offers a choice to scan it at 16bit or 32 bit. Chapter 4 Discovering the selection tools painting selections the easy way giving transformed selections a try feathering away Keeping selections for later use Using the vanishing point feature. Think of selections as windows in which you can make changes to the pixels. Areas that are not selected are masked which means that these unselected areas are unaffected by changes. If you move a selection with the move too this leaves a blank spot in the image. To clone or copy and move the selection at the same time. use option and drag the selection with the move tool. The marquee tool is the main selection tool. By that we mean its the tool you will use the most often for creating selections. The exception of course is when you have a special situation that requires the lasso, magic wand or the quick selection tool. The marquee tool includes the rectangular marquee (obvious) the elliptical marquee (for round or elliptical selections) and single row marquee or single column marquee tools for creating a selection of a single row or column of pixels. To select hit M while over image. to deselect choose cmd +D or click outside of the image. Magnetic selection follows lines in image. To move it to another part of image hold down space bar and then move it. If you have created an effect that you like and want to use it multiple times in your image you can by. With the marquee tool selected, select the fixed size from the style drop down list on the options bar. or a proportionally correct selection but not fixed to an exact size. On the options bar type the width and height values into the appropriate text fields. Then click the image a selection sized to your values appears. With the selection tool drag the selection to the location that you want selected. When you use your marquee tools you can drag your selection to another location without affecting the underlying pixels. If you want to move the underlying pixels press cmd and then drag the selection. The lasso tool. For free form selections. Selections of an irregular shape. If you dont complete the circle photoshop does it for you by finding the most direct route back to where the selection started. Just like the marquee you can press the shirt key to add to a lasso selection and press the options key to delete from a lasso selections.